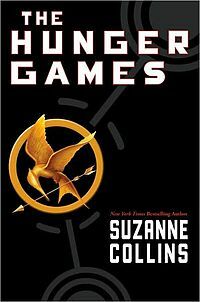 The other day, Jeff Goins posted a blog entry titled Why the Hunger Games is the Future of Writing. I respect Mr. Goins, and am sure he’s a fine fellow, but I disagree with him on this issue, and now I’m going to list the reasons why. Hunger Games isn’t the future. It’s now. It’s the Latest Big Thing. The market is already flooded with YA titles trying to cash in on the success of Twilight, and editors and agents are plumb sick of it. Thanks to the success of the book and the movie adaptation, soon the market will be flooded with YA titles trying to cash in on the success of Hunger Games, and editors and agents will be sick of that. You don’t embrace the future by imitating the last known success. Call this a bias if you like (and you’d be right to do it) but I did a little informal poll of my fellow readers / authors, and not one of them self-identified with Goins’ idea of “cultural ADD” and the notion of scanning. Of course, Goins implies in another other blog post that authors should aim for a functionally illiterate audience, because no one reads. 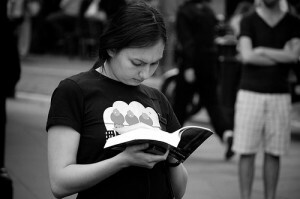 Do you really want to aim your book at people who won’t read it? 3) Mass success is not the only road to writer satisfaction. Granted, Goins is talking about the road to blockbuster success with the YA crowd. Within those parameters, he has a point. I don’t agree with his thesis that “we are all YA,” in no small part because I find most YA titles I’ve read simplistic and not terribly interesting (and yes, I’m sorry to say that includes Hunger Games). 4) Books are not movies, the Internet, or television. Goins posits that to succeed as writers, we must appeal to the shortest attention spans possible, since the written word is in direct competition with the Internet and various electronic forms of entertainment. While I think some people certainly might approach a book the same way they would a blog or a Facebook post, I don’t think most readers work that way. Also, the key to maintaining reader interest? Good writing. Not big fonts, short sentences, or simplistic storylines. I believe Collins succeeded because she had a compelling concept, a great protagonist, and knows how to manage tension. Those things aren’t a function of story length. Maybe Goins is right and the future of the novel is the pamphlet. All I can say is, I don’t think so. And I certainly hope not. And since I have no interest in writing in a style or genre that I dislike, I’m going to be fighting against this trend all the way, uphill or not. Today I want to talk about John Carter. 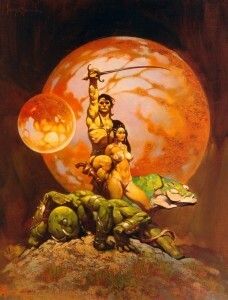 Not the Disney movie and how it’s apparently taking a bath at the box office (which, as a Burroughs fan, I find depressing), but the original Barsoom pulp stories of Edgar Rice Burroughs. The first John Carter story, A Princess of Mars, was published as a serial in 1912, then re-published as a novel in 1917. The follow-up novel, The Gods of Mars, was published in 1918, followed by The Warlord of Mars in 1919. While the first book is decent enough in its own right, the story takes off with Gods of Mars, and it’s that book I want to discuss. Like A Princess of Mars, Gods was serialized in The All-Story in 1915, released in five parts over a period of months. There’s plenty about the John Carter stories that’s a little dated now — the Martian environment, the series of helpless princesses in need of rescue (I kid you not, Gods of Mars has three different damsels, all of them scantily clad, all in distress at one point or another). Like many products of the early 20th century, it has a couple uncomfortable race issues, and, like most pulp stories of the period, more than a few story-saving coincidences that an author could never get away with now. But a modern writer can still learn a lot from Burroughs. The protagonist has strong, clear goals. At the beginning of Gods of Mars, John Carter is fighting for his life. He’s dropped into a deadly situation and must fight his way through a hostile environment — escaping first from deadly creatures and then from captivity. About halfway through the story, Carter finally gets home — only to find his wife, Dejah Thoris, has gotten herself captured again. (Cue sad trombone.) Carter spends the rest of the book chasing after Dejah Thoris and mowing over everyone who stands in his way. Sure, along the way he meets a son he didn’t know he had, topples a religion, starts a war with three different factions, and sends a would-be goddess to her doom, but that’s all incidental. 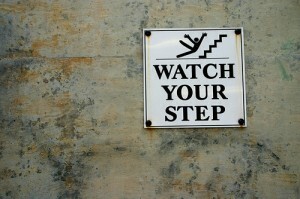 Every chapter features a setback. Carter never gets a break. At the end of every chapter, he’s tossed down a pit, clapped in irons, outnumbered by bad guys, facing down a dozen monsters. No sooner does he rescue some princess or another than she’s snatched away again. 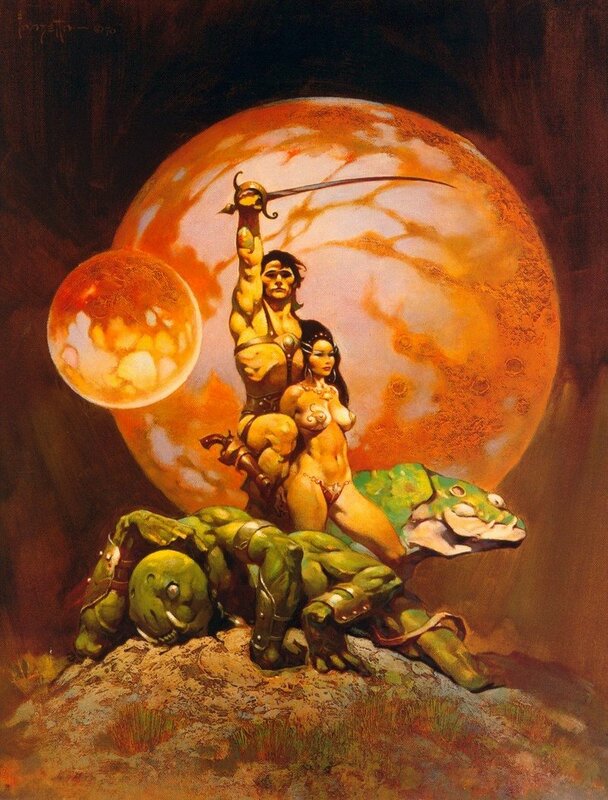 Granted, the Barsoom stories are straightforward pulp adventure, and thus focused on non-stop action, but there’s something to be said for the way Burroughs structures his stories. Even when Carter has some downtime, it’s simply a breather before he starts pursuing his goals again. As Gods of Mars progresses, the protagonist goes from being lost in hostile territory, to uncovering the secrets of a fraudulent religion on a planetary scale, to toppling a goddess and becoming a fugitive from his former allies, the Red Martians. Burroughs keeps raising the stakes, and each minor goal Carter achieves just puts him in a worse position. If you want to examine the principle of “move the protagonist further from the goal until he finally reaches it,” Gods of Mars is a good example of how to do it right. Some elements of the Barsoom stories may seem a bit dated to modern sensibilities, but some storytelling principles are timeless, and there’s a reason Burroughs’ work is still being retold a century later. Photo by marrycunningham on Flickr. Even the most well-meaning friend can unwittingly undermine you with a destructive or demoralizing piece of advice — even when it’s technically sound. 1) Don’t release it for free, people will devalue your work. 2) Don’t sell it, people love free. 3) Release it now, it’s totally ready! 4) Don’t release it now, it’s totally not ready. 5) Don’t release it at all, it will sabotage your later efforts. 7) Your novella can’t be better than your next book because people don’t expect an author’s quality to go down over time. In terms of the narrative, advice was equally split. Everyone had a favorite character. None of them picked the same one. Too much romance. Not enough romance. Tone down the action. Crank up the action. And so on. Now, all my friends are fine people. And clearly, they all want to be supportive. But if I tried to implement their suggestions equally, I’d quickly lose my mind, because it can’t be done. This sort of contradictory advice is all over the blogosphere, too. I’ve read more vehement debates about the free / 99 cent Kindle issue than I care to think about. Some of it is market-driven. Some is just cynical. Most is utterly subjective. All any of us can do is stick to our convictions, move forward, and always keep learning. And that’s no real revelation, but sometimes it’s easy to forget. Photo by cristiano_betta on Flickr. Authors! Tired of positive reviews? Want to lose your audience fast? Here’s a handy guide to ensuring readers will put down your work and never pick it up again! There’s no need to introduce the central conflict of the story for at least seventy pages. Readers appreciate “immersion” in your world, so include several chapters of the characters walking around, greeting people, showing up places, and describing their own environment to themselves — maybe even out loud. Set your opening in a tension-free environment, like a nice country fair or a drama-free family dinner. Also, make sure the main character gets in touch with his or her feelings about the things that aren’t happening. If the central conflict of your story suddenly becomes muddled and unclear, just have characters talk about it. A lot. Speculate about possible futures at length. Don’t introduce any new stimuli, just let the characters hash it out over coffee. Make sure your readers don’t miss an instant of their painstaking discussion. Make sure you create a situation where there’s no ticking clock or external pressure — that’ll just get in the way of your character’s conversations. Don’t stop until you’ve covered every possible permutation of the emerging circumstances. Readers love that. There is nothing a reader enjoys more than a juicy twelve-ton slab of description. Go on, give that sunrise a page and a half all its own. You’ve earned it. Catalog the entire contents of your protagonist’s room. It reveals character! Relate the entire history of the characters’ home town. Stephen King would go on about Maine for a thousand pages at a time, and he’s a zillionaire. And if you need to set up a relationship, make sure the reader knows the entire history of each character, preferably starting with their childhood or even their birth. It’s all about context. Don’t get all breakneck like Dostoevsky or Dickens. Those guys were crazy. First, establish the theme of your story and the narrative question you intend to answer. Then, halfway through, quietly forget about it. Readers will praise you for your cleverness. You’re defying expectations! So your protagonist just sort of forgets about his goal. So a looming threat kind of fizzles out because it was too complex to try to resolve. So a burgeoning romance vanishes without a trace because you lost interest. Whatever! It’s all about the journey, so who cares what the destination might have been? Your book is important. It has a serious message, so make sure people don’t miss it. Get out that bullhorn and blast your pedagogy from every chapter heading and conflict resolution. Turn those who disagree with the political or cultural views of the protagonist into one-dimensional idiot monsters. Gloss over any inconvenient flaws in your protagonist’s ideology. Your goal is not entertainment, but conversion. You’re enlightening the ignorant masses! 6. Grammar? This isn’t school! Editing is for squares and people who don’t have a style. You’ve got a style, man. James Joyce made up words willy-nilly! e.e. cummings didn’t capitalize the letters of his name, so why should you capitalize anything? Spelling is just The Man telling you how to arrange letters — plus, there’s that one study showing how you can scramble up letters in words and people will still understand them! Surely no one will think you’re an obnoxious dolt if you do that. You’re a rebel iconoclast and you’ve got no time for apostrophes. Yes, I am in a sarcastic mood today. So, readers. Anything I missed? 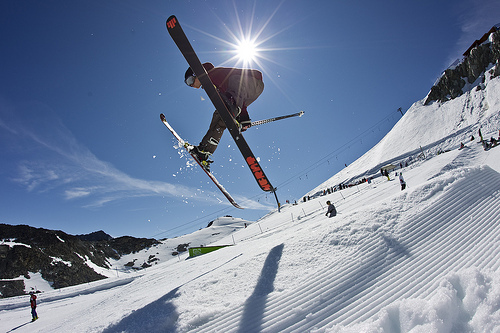 Photo by campofchampions on Flickr. Today, I want to talk about momentum. If you’re a regular reader, you may have noticed the three-week silence. It’s not that I haven’t had anything to say — I just couldn’t seem to get around to saying it, and the longer I waited, the more difficult it became. Yes, you will improve the more you write. You’ll refine your craft. You’ll generate words, complete stories, put in the time necessary to attain mastery. But the words you write are also the fuel for more words. Every day you write makes the act of writing a little easier — and, conversely, every day you don’t write makes it a little harder. In his book The War of Art, Stephen Pressfield calls this avoidant tendency “Resistance,” and names it the deadliest threat to creativity in existence. It can take any number of forms — procrastination, distractions, self-loathing, and good old-fashioned surrender. Any of this sound familiar? Tangentially, this is why I’m so fond of the Write or Die application. WoD forces momentum on the writer, punishing procrastination with a red screen and ear-splitting noise. It creates a Pavlovian response to just keep writing, instead of agonizing over word choice. Which is another piece of advice writers love to dole out, but hey, why cultivate self-discipline when you can just get a machine to harangue you, am I right? This is the information age, we’re not barbarians. Of course, you don’t need Write or Die. The basic functionality can be duplicated with a simple alarm clock or timer, or even something like the Pomodoro Technique. I just happen to like Write or Die because it’s integrated. The point is, the application creates a microcosm of momentum, forcing the writer forward. But the responsibility is still on the writer to boot up their text editor or word processor every day and just do the work. Despite best efforts to the contrary, it doesn’t get any easier the longer you wait. I’ve tried it hundreds of times. Unwritten words tend to take on Herculean proportions the longer they’re left unattended. Soon even a meager piece of flash fiction seems too intimidating and grotesque to contemplate, and it’s easier just to put things off until tomorrow — and tomorrow, and tomorrow. The solution is momentum. You can make it work for you, or you can sit back and let it work against you. The choice is yours.